The UK housing market has staged an incredible recovery since the financial crisis, so does that mean houses are now too expensive, or can house prices just keep going up? 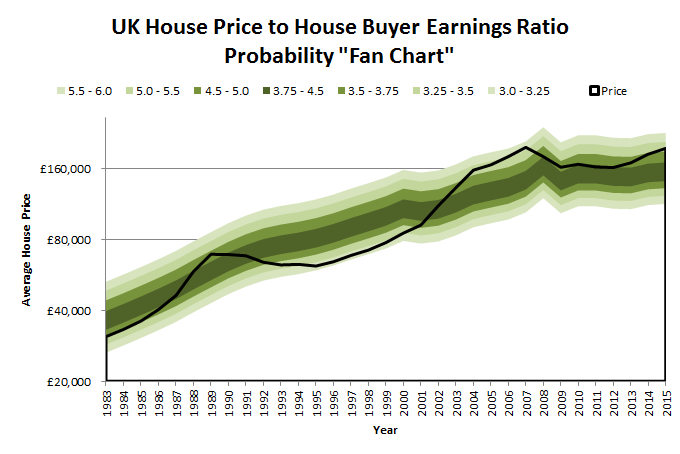 To do this UK housing market valuation and forecast I’m going to borrow a couple of visual tools from my work on stock market valuations and forecasts, namely my “fan chart” and “heat map”. A common method of valuing both the stock market and housing market is the trusty old PE ratio. Because stock market earnings are quite volatile, I think it’s best to “cyclically adjust” those earnings by comparing the price of the stock market (e.g. the FTSE 100) to its 10-year average earnings. However, in the case of the housing market, it makes sense to compare the average house price to the average earnings of home buyers, and the average earnings of home buyers is not very volatile from year to year, so no “cyclical adjustment” is required. That’s good, because it makes the whole thing a lot easier to calculate. Home buyers are an obvious choice in terms of whose earnings to compare house prices to. After all, they’re the people buying houses, so what sort of multiple they have to pay is important. The Halifax House Price Index web page currently has a link to a spreadsheet called “Historical House Price Data”, which contains the house price and earnings data for home buyers back to 1983. Using the Halifax data, since 1983 the median (i.e. middle) value for the UK house price to (home buyer) earnings ratio has been 4.1. Of course, home buyer earnings have increased a lot since 1983 and so, even if house price valuations had remained at a steady 4-times average home buyer earnings, house prices would have increased considerably. But house prices didn’t remain steady at 4-times home buyer earnings. Instead, house prices have been far more volatile, going from just 3.1-times earnings in 1996 to more than 5.8-times earnings in 2007. However, despite that volatility, in the long-run house prices tend to stay somewhere around 4-times (home buyer) earnings, primarily due to supply and demand. When the house price to earnings ratio is far below average – More people can afford to buy, which prompts them to leave rented accommodation and buy their own home. This increases demand, which tends to push prices up. At the same time, low prices reduce profits for house builders, so the supply of new houses drops off. This also tends to push prices up. When the house price to earnings ratio is far above average – Fewer people can afford to buy, so demand drops. This means there are more sellers than buyers, which tends to push prices down. At the same time, higher house prices prompt house builders to build more houses, which increases supply. This also tends to push prices down. The “fan chart” below is my attempt to show how house prices have moved above and below the long-term average price to earnings multiple of 4, and that average house prices are more likely to be closer to that multiple than far from it. Darker greens – Represent house prices that are closer to the average PE ratio of 4. Lighter greens – Represent house prices that are far above or below the average PE ratio of 4. House prices do not always go up! As the chart hopefully makes clear, the value of the average house trading at the average PE multiple of 4 (a price which I tend to call “normal” or “fair”, and represented by the dark green band in the middle) has increased substantially since 1983. In 1983, the average home buyer earned around £8,800 a year and so an average house, trading at the long-run average earnings multiple of 4, would have sold for £36,000. In fact, in 1983 the average house price was £31,000, so by this measure the market at that time was actually slightly cheaper than “normal”. By 1989 the picture had changed completely. Average home buyer earnings had grown by 62% to £14,300, but house prices had jumped ahead far faster, up 123% to £69,000. This put the market on a house price to earnings ratio of 4.8, well above the average of 4 (and the PE average was much lower back then too). The mid-90s saw a massive slump in house price to earnings ratios, as house price values fell year after year while earnings continued to increase. By 1995 the average house was just 3.1-times the average home buyer’s salary. When I bought my first home in 1996 (a 4-bed flat in London) it was valued at just 2-times my measly salary. I didn’t realise how lucky I was to be buying at such reasonable valuations. And then of course we had the Great Property Bull Market, which lasted approximately from 1995 to 2007. By the end of that heady period, average home buyer earnings had swelled to £34,600 and the average house price had ballooned to more than £199,000, giving the market peak a PE of 5.8, almost 50% above the long-run average. The UK housing market is clearly expensive relative to its historic price to earnings average, although that’s hardly news to most people. According to the latest data from Halifax, the average house price is back above £196,000. The housing market’s price to earnings ratio has also crept back up to 5.1 in recent months, having cooled off somewhat to 4.4 during the post-financial crisis slowdown. Because of the supply and demand factors I mentioned before, the most reasonable guess (as that’s all it can ever be) for medium-term (5 to 10 year) house prices is for the market’s price to earnings ratio to return to its average value. If, for example, the average UK house was priced at that 4-times home buyer earnings ratio, it would be valued at about £154,000, not the £196,000 it currently finds itself at. That’s a fairly substantial decline of £42,000, or more than 21%. Of course, I’m not saying the market is going to collapse in value to that level. It could take years for the housing market’s PE to revert back to its median value. In fact it probably will as the housing market usually moves quite slowly, especially when compared to the stock market. However, over perhaps a 10-year timeframe, I would say the most likely direction for the house price to earnings ratio is downward, back towards 4. This currently implies a forecast average house price of £154,000, although that “fair” or “normal” value will increase over the years as home buyer earnings increase, hopefully in line with or faster than inflation. To help you visualise how current valuations impact future returns, have a look at the UK housing valuation “heat map” below. The heat map chart is based on the same data as the “fan chart”, but this time the focus is on highlighting how high valuations have historically led to weak future returns, while low valuations have led to high future returns. With Halifax currently putting the average house price at £196,000, the UK housing market is currently in the 5.0 to 5.5 PE range (the orange zone on the heat map, implying pretty “hot” valuations). Using the terminology from my FTSE 100 valuations, that makes the UK housing market “expensive”. If average house prices exceed £207,000 the housing market will move into the “very expensive” red zone. Looking at the overall housing market is useful, but of course there are a lot of regional variations in price. The best summary I’ve seen of regional house prices and regional house price to earnings ratios is on the Retirement Investing Today blog. One feature of the housing market is that as houses become more expensive, people on lower wages cannot afford to buy them. As a result, the average earnings of home buyers increases as those on lower incomes have no choice but to rent. This can make houses look more affordable if you use average home buyer earnings in the house price PE ratio, because average home buyer earnings are increasing faster than the average earnings of the UK as a whole. The ratio between UK average earnings and average home buyer earnings between 1983 and today has averaged about 1.55. Today the ratio is 1.69, which is about as high as it has ever been. That means house prices are likely to look even more expensive in terms of PE, when UK average earnings are used in the ratio instead of home buyer earnings. I think it’s worth having a look at the long-term relationship between UK house prices and UK average earnings, so I’ll do that in a follow-on post. That is amusing, John. I was writing an article on the Housing P/E recently but have not finished it yet. I argue that maybe the “new normal” for house P/E is perhaps 4.5 rather than 4 times. I will try and finish that sometime soon. I’d love to know people’s thoughts. It is just musings more than anything else, though. I think you’re right though. House prices over the medium term look more likely to go down as opposed to up. But of course, over the long-term the likelihood is generally up. Your note about the average house-buyer earnings P/E ratio is very important and one I had not really thought about before. Hi DD, I’m always a bit wary of “new normals”, like the new normal valuations in the dot-com boom or the new economic normal of NICE (Non-Inflationary Consistent Expansion) during the 2000s. However, things do change and perhaps permanently higher valuations are here to stay, but I doubt it. Clearly, at over 5 times earnings we should see the P/E ratio drop a little sometime in the near future. However, how we go about buying houses has changed dramatically and we remain fixated on its as an asset. It will be interesting to see whether this is the case that it has pushed the baseline up a bit or not long-term. I will try and finish it sometime soon! As I understand it Halifax use the average Male salary. Given that many households now have 2 earners, I would argue using the ratio may be a bit miss-leading and the House Price Earnings Ratio would be expected to be much higher than 4.1. Hi Neil, I think you may be right. The next post will look at house prices to UK average earnings, and on that measure the multiple is far higher. 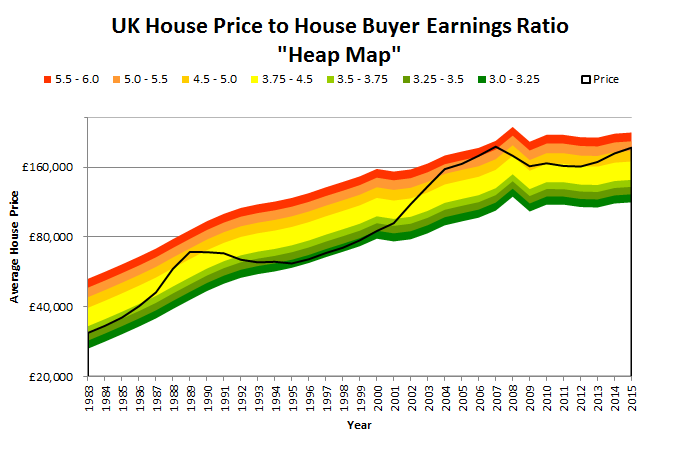 However, what really matters is how far above the long-run average the ratio is, and on that basis as well I’d expect house prices to look more expensive compared to UK average earnings. Hi John, The average UK salary is £26K, so the figure of 5.1 seems wildly conservative and possibly misreported by the Halifax for vested interest reasons perhaps? The earning used in the analysis are home buyer earnings, which are significantly higher than the national average earnings, as I’m sure you would expect. The figure I have for national average earnings is £22k, while home buyer earnings is £37k. As I mentioned at the end (which you may have skipped!) the ratio between average earnings and home buyer earnings is historically high at 1.69, compared to an average of 1.55. I’m going to use national average earnings in a follow-on article, probably next week where, as you suggest, the PE ratio will be much higher (and even more so for London). I suppose that house prices are all about affordability, even for Russian millionaires who buy property in London. Affordability is based on interest rates and money supply. QE was a big play on money supply. As the BoE bought all the Gilts available, investors and insurers moved to other assets and property was an easy choice. From here there are two options: the growth of the economy stagnates and QE is resumed, the economy starts to do well, some inflation and increases in wages will increase the denominator in your fraction. For property prices to go down significantly the economy needs to shrink, not impossible but avoidable if the QE is resumed. There is a supply issue as well, there are very few properties on the market. There is also a shortage in skilled builders. I am positive in the property as an asset class at this moment. London house prices are largely driven by rental prices. Affordability in London depends on yield and not just availability of credit. 5x, 10x, 20x P/E make less difference than say 5% or more yield. Prices were largely flat for 6 months, now they are rising again. Already prices have gone up in Hackney, Islington will surely follow suite. The increase in BTL is distorting the market (creating a different market). I wonder if this increases the risk of a larger correction. Cheap credit and high demand for rental rooms, with people willing to pay higher rents. One of those could easily change. But, maybe it’ll be softened by the demand. So, I would say that right now, in London. 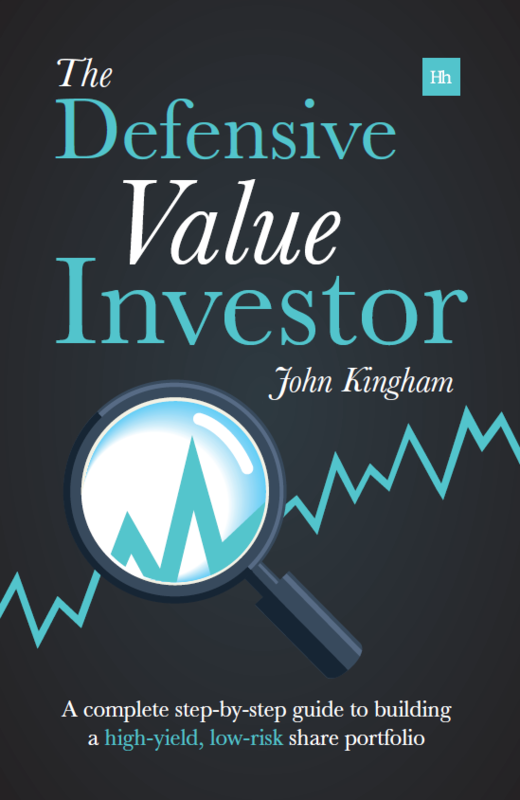 Prices are not excessively expensive, even of the P/E is high. Prices look to go up, rather than down. Hi AAJ, prices are definitely rising but I think London prices are insane. However, that doesn’t mean they won’t keep going up! The flat I bought in 1996 for £40k (£10k per bedroom!) is now apparently “worth” £250k, and the house my parents bought in London in 1992 for £90k is now “worth” £550k. If that isn’t insane I don’t know what is. The sort of people who would buy my old flat in 1996 would never in a million years be able to afford it now. I think that’s wildly unsustainable, but of course I could be very wrong. I think the affordability of these huge prices is driven by super-low interest rates which are most definitely not guaranteed to last forever. I guess for those who are mortgaged up to the hilt, interests rates should stay low, but for those of us who want to see truly affordable housing, the Bank of England rate should get back to “normality”, i.e. 3-5% or thereabouts, with mortgages a percent or two above that. And of course someone needs to build a million or more new homes to increase supply. You are absolutely right. The low interest rates offset the lower (than one might like) yield and push up prices. The prices look insane, especially to myself who would like to purchase a flat, but for now the profit is there. Medium term a rise in interest rates will (hopefully) slow price rises. 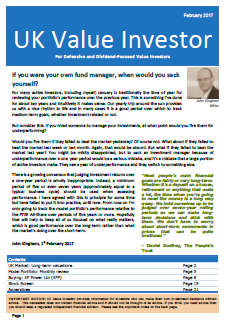 I think your analysis using P/E is a good indication as to the market outside London though. London prices just have a few more factors to add in. Maybe one day in London no one will own, everyone will be renting 🙁 Maybe Londoners will end up like in Hong Long with 3 generations living in a 2 bed flat. Perhaps, but at least with London people can choose to move into the surrounding counties, so there aren’t quite the same space restrictions as there are in Hong Kong. Really like this analysis and fan charts. I wonder if it would be worth applying to ‘affordability’, too, for completeness, if you get a chance (i.e. mortgage payments as a measure of % of household earnings, which fluctuates as you know will fluctuate with interest rates). As AAJ says, the big thing missing — and possibly the ‘new normal’ — is that we’re living in a BTL world. I am no longer sure exactly what BTL means long-term (I thought I knew, but I was wrong before — or at least wrong in a world of Bank Rate near-zero…) but I think it must be relevant compared to the old world, where family style homes were overwhelmingly bought by families, and even flats and so forth were owned by a different kind of property owner. I’m always wary of “new normal” thinking compared to “long-term average” thinking. I’m not saying there isn’t a new normal, but I would always be wary until it has many years (decades?) of history to support it. BTL is a massive factor in all this, as is population expansion, failure of house/homebuilding to keep up, more people living alone, low interest rates. However, in the long-run many of these things tend to balance out with supply and demand, although a hugely illiquid market like housing is the super-tanker of all super-tankers; it takes forever to turn (in this country at least). Still, the idea of looking at the ratio of mortgage payments to earnings is an interesting one and obviously we’re likely to be at the upper end of historic norms. If I can get the data I might do the analysis depending on time/effort/etc. The real problems come when you get a double whammy or double leverage of factors, like unsustainably high earnings in the stock market multiplied by unsustainably high PE ratios. Or in housing, abnormally low interest rates (and therefore cheap mortgage payments relative to the size of the loan) and abnormally high mortgage payments as a percentage of earnings (as we probably have now). People just invariably have a short-term view. If you’d asked someone in 1989, when the Bank Rate was 15%, if rates would be zero by 2015 they’d think you were crazy. After all, the rate had been above 10% for pretty much the whole of the 70s and 80s. But now they’re zero and have been for 6 years. Could the Bank Rate reach 10% again? Within a decade? Of course it could. I have no idea what the probability is but it isn’t zero. As for BTL, who knows what legislation and tax changes might be made if the BTL brigade become demonised like the bankers. Paraphrasing Murray Walker, “Anything can happen, and it usually does”. Indeed, but again, will that last forever? Perhaps, although I certainly hope not. I read something about this recently. Another way people value house prices is by rental P/E ratio where the E are the earnings an investor could expect. The rent after presumably expenses and taxes. Apparently this is better because it compares housing directloy to other uses of money such as stock market investing. So, for example, I recently sold a flat at $320K which made me $6K a year so the PE ratio was 320/6 = 53! Yes I was happy to get rid of it. Meanwhile I have another that has a PE of about 15 which is in another region. Hi Andrew, you’re right, looking at income yields is an entirely legitimate way to value property. If I had the data I’m reasonably sure it would produce the same sort of picture. In fact I might be able to pull the data together because Halifax have mortgage payment data, so if I assumed that mortgage payments were the same as rent (obviously not true, but perhaps a reasonable fudge/workaround) then I should be able to compare prices to mortgage payments or “rent” over the same 1983-2015 period. Perhaps I’ll give that a go next month. I worry that the housing market is not truly an open market due to external influences such as government & BoE intervention (help to buy, interest rates, QE), and of course planning laws that restrict the supply side of the equation. These are driven by political aims which can sometimes be influenced by misguided or short term goals, so may not always be helpful over the long term. I accept reversion to mean will win through but it is much harder to predict when it will happen, and it could take decades, meanwhile giving the illusion of a “new norm”. It makes personal planning for the housing market very tricky! Meanwhile your heat map is a great compass for the likely long term trend! Hi Ric, that’s a good point. I think if politicians thought they could influence the stock market they would try to. But obviously they can’t, so they don’t really try (at least directly; obviously they influence it indirectly through economic policy etc, but in the short-term those things are irrelevant). As for housing, it seems that if they come up with various schemes like “help to buy”, or simply by not ensuring that enough houses are built, they can, within reason, have some degree of control over house prices (and therefore the likelihood of being voted in by home owners, who I guess will be inclined to vote for whoever is least likely to trash the value of their house!). Unfortunately, mean reversion could well take a couple of decades. My guess is that it will take about as long as it takes for interest rates to get anywhere near normal, which could take anywhere from a couple of years to a couple of decades (although I’d prefer the former to the latter). However, if you step back far enough all of those details fade from view and you’re left with long-term averages and mean reversion, which are much easier to understand and probably better at “predicting” the future than a detailed knowledge of current affairs (in my opinion). So yes, planning when to buy and when to sell is very hard, and market timing the housing market is probably just a bad idea in the property market as it is in the stock market. Thank you John. Would you be able to apply the same visual tools to London? Perhaps when you do your next blog regarding geographical income vs buyer earnings? It would be fascinating to review as this as London is a market unto itself. Much appreciated. I think I have the data to do that and yes, London would be the obvious choice to do a localised version of this analysis. I’ll try to fit it in sometime this month. Thank you John, I look forward to that post with interest. I wonder whether the changes to BTL and non-dom status will dampen prices in London over the medium-term. Great article. I found it really interesting and will think more about this subject in the future. House market is not my area of expertise, but now I can see, that PE ratio can be very useful in this area. Lately, I ve conducted an analysis of using PE for creation folios on LSE. I think, that many people here can be intrested in this subject to.